After two quarterfinal losses at this tournament in the past, including to Stephens last year, Sevastova played a smart match to beat the defending champion and reach her first Grand Slam semifinal. Latvia’s Anastasija Sevastova reached her first ever Grand Slam semifinal on Tuesday, with the 19th seed easing past defending US Open champion Sloane Stephens in a dominant performance. The pair met at the exact same stage at this tournament last year, and contested a thrilling contest in the Arthur Ashe Stadium. 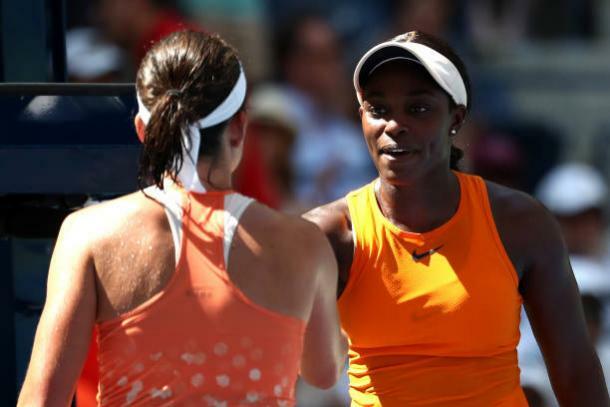 Sevastova had been a break up in the decider, with points for a double break, though Stephens rallied and won the final set in a tiebreak on her way to the title. The Latvian then proceeded to beat the American in straight sets at the WTA Elite Trophy towards the end of 2017, though Stephens comfortably won when two faced off at the Rogers Cup last month. Stephens was undoubtedly the favorite coming into this encounter, considering her two previous victories over Sevastova and her impressive wins against Victoria Azarenka and Elise Mertens prior to this, but the third seed was far from her best today. The American made several costly errors and often couldn’t take advantage of her opportunities, in contrast to Sevastova who played a smart match and responded well when placed under pressure. It was Sevastova, after two consecutive losses at this stage in Flushing Meadows, who progressed to the last four with a 6-2, 6-3 win in an hour and 24 minutes to set up a meeting against Serena Williams or Karolina Pliskova. The early stages of the match were fairly nervous, with particularly Sevastova struggling on serve in the opening couple of games. However, it was the Latvian who eventually drew first blood, impressively saving four break points before breaking Stephens for a 3-1 lead in the opening set. Despite falling behind, Stephens continued to apply pressure and created three break back point chances, though could not convert any of them as the Latvian held for 4-1. Though the American was fighting hard, too many errors were coming off her racket, which helped Sevastova break to love to seal the first set. After a strong first set, Sevastova started the second set strongly, breaking early on for a 2-0 lead, with her opponent struggling and looking fairly lost in the tricky conditions. Stephens was able to break back as she aimed to work herself into the match, though was immediately broken again to trail 1-3. As the 19th seed consolidated her second break to hold a 4-1 lead, it appeared as if she would storm into the last four, though Stephens put together a good passage of play as she held and then broke in a tight game for 4-3. However, Sevastova was undeterred, breaking for a third time in the set, and converting a third match point on her serve to progress.